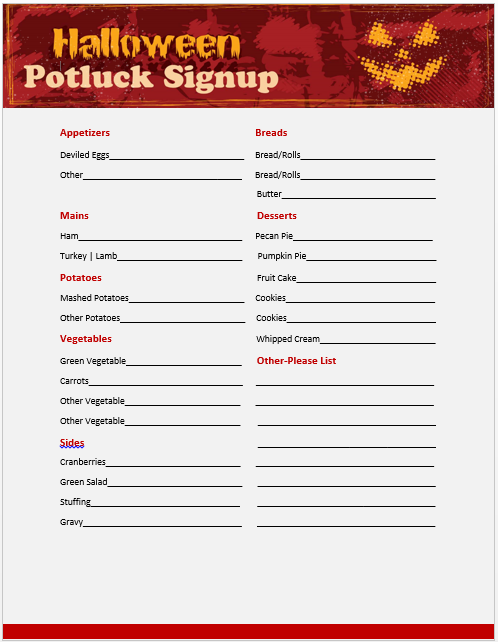 This article brings you free potluck signup sheets for your next potluck party. If you are thinking to organize a potluck party, it’s a great idea to break the usual monotony. Also, if you are em employee, and you are suggesting your colleagues to plan an office potluck party, the occasion will be perfect to display some cooking as well a team player skills. It can be a wonderful opportunity to chat with those in your office who are in other departments. However, planning for an office potluck party is not as easy as it may seem. 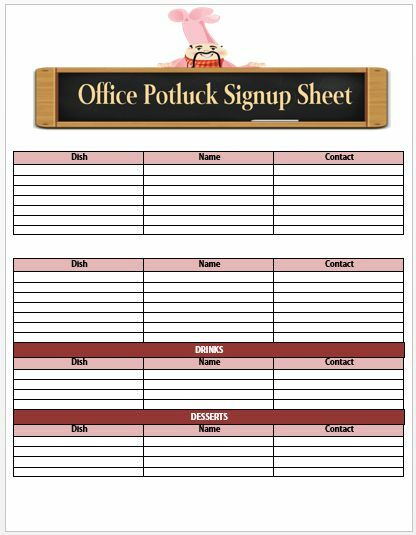 You need to have sign up sheets to ease the process and we have brought for you a good collection of such office potluck signup sheets that you can easily download with a single click. 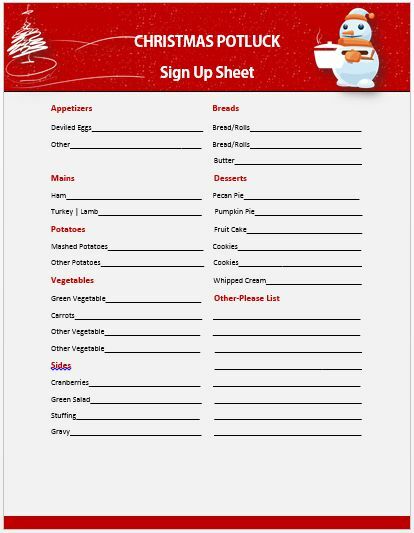 The sign up sheet has a red and white color scheme with presence of a distinct shade of yellow in the header box at the top. An illustration of a chef above the same with a smiling face gives it an endearing look. The sheet has a design layout which has three different parts. One is the image part at the top-right with an image of multiple lip-smacking dishes and the header part at the top-left in green. The third part is the rest one consisting of the text part on a white background with a watermark of a knife, spoon, and fork. An image of a neatly folded red napkin and cutlery near the header makes it clear that the sheet is for an office potluck party. The rest of the color scheme in various hues of brown and white also looks attractive. 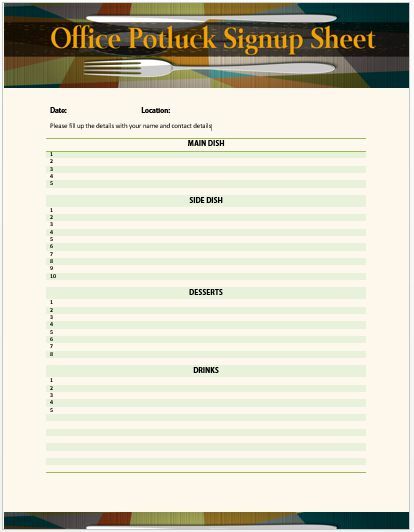 The signup sheet is a simple one with numbers and rows under different headings for the food menu below the header part that consists of an image of fork and knife on a printed colorful background. 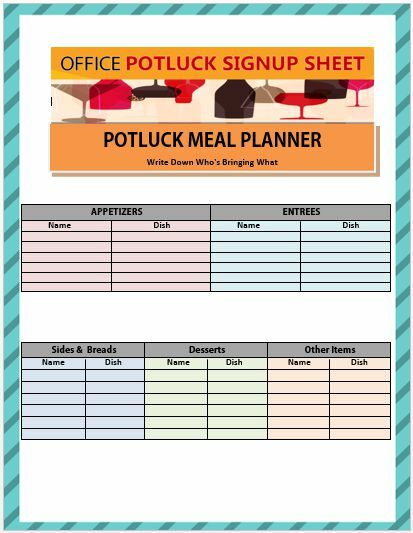 The office potluck signup sheet also doubles up here as a potluck meal planner and has a beautiful green border with slanting stripes in a contrasting color around a white background. The use of variety of subtle colors for the cells of the table looks quite interesting. With clean images on both sides of the header, the sheet has a design layout that features two columns with ample space to write your text on a light yellow background. The sheet is quite a bright one with the use if colors like bright red, green, pink, and more on a peach color background that gives it a sophisticated look without making it look dull. There is also an image of professionals behind the header. The sheet consists of a single table below the header with alternative light red rows on a white background. The use of a beautiful image at the top-right and a red horizontal line at the bottom makes it even more charming. 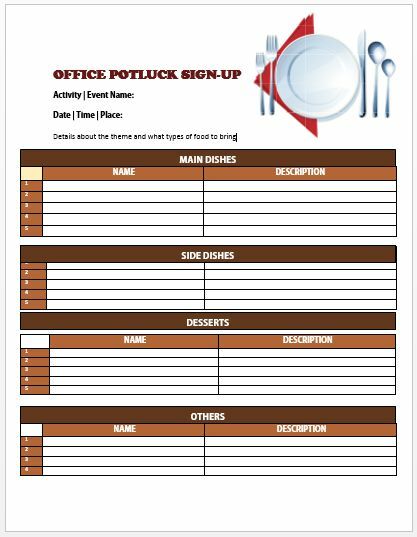 If you are looking for an elegant office potluck signup sheet, choose the above one with a light gray background and a beautiful header box containing the header in bright yellow at the top. The signup sheet consists of a cute illustration of a cook beside the header in dark chocolate brown on a light green colored background. It also feature four tables with multiple rows and two columns each. 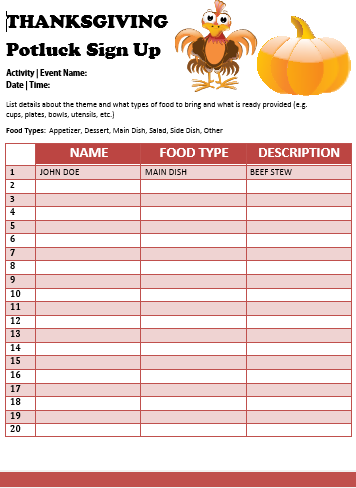 The signup sheet comes with attractive image of different food items at the top-right and a bright yellow header. The rest part is in a distinct shade of green having the requisite text in contrasting black. The sheet comes with a no-frill design and a single large text box with several horizontal lines under different headers on a pristine white background. The sole colorful element on the sheet is at the top-right corner in bright orange. 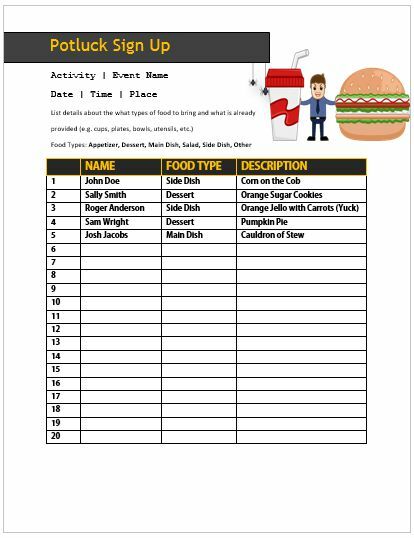 A combination of burger and coke is infectious and the more infectious is the signup sheet above that feature a large table with four columns and a bright yellow header on a black header box. So, let us have a look at the things that you must do for Office Potluck Party. Bring tongs and serving platters along with your food item as per the requirement as many colleagues may think it is socially acceptable to serve the food by using their bare hands. Avoid tagging your significant other during an office potluck party unless others are OK with this as office potlucks are a prime occasion to mingle with colleagues. Unless it’s standard at your company to bring a significant other to a lunchtime potluck, don’t do it. Office potlucks are occasions to socialize with coworkers and are typically not the time to bring in a significant other. 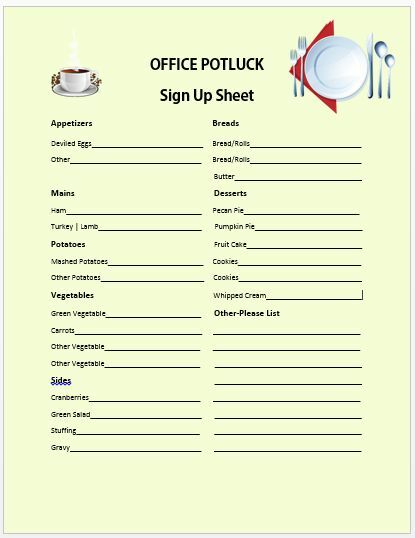 Although sending an email invitation is the easiest way to communicate all about the office potluck party, you can also make use of some unique office potluck party sign up templates that will add an element of fun to your party and will encourage every employee to participate in the same. 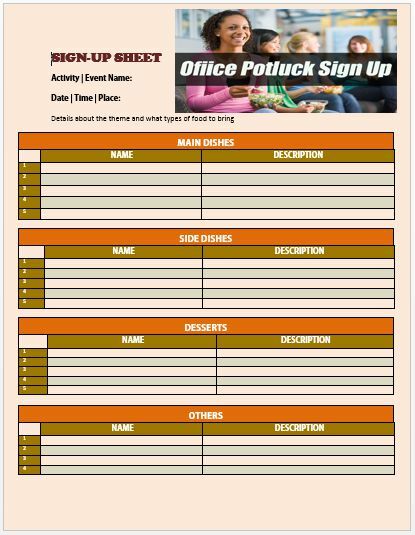 So, you can use these free office potluck party signup templates for your next potluck party to be arranged in office. Are you planning a breakfast potluck next week? If yes, there is no need to have so much stress as planning the same is easy. Hosting a breakfast is also a great idea to relish home cooked food in a lazy Sunday morning. However, it needs a lot of planning like deciding the theme, menu items, preparation of a guest list, sending them invitations, and a lot more. 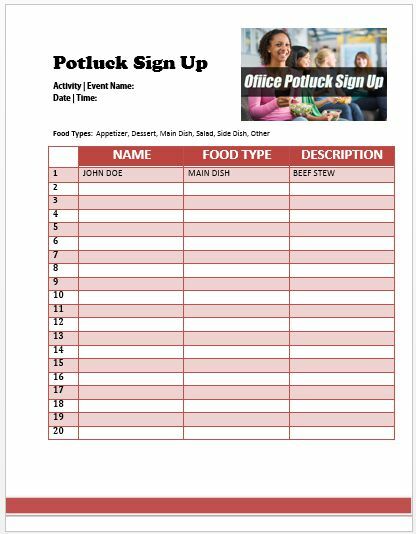 Most of all you need Breakfast potluck sign up sheets to get your guests to sign up for the food they are planning to bring. 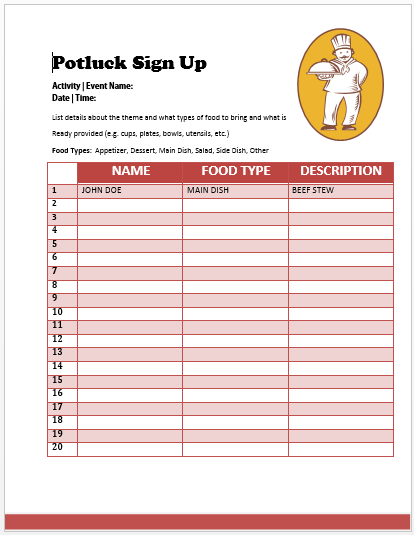 In this article, we tried to provide such free potluck sign up sheets for your next potluck party. 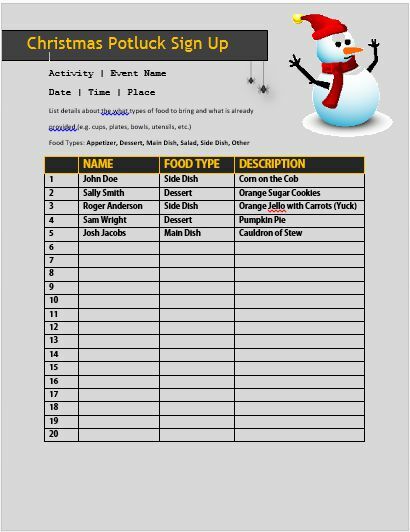 Download the template that suits your need and customize the table columns and rows based on the party theme. Enjoy! The signup sheet is an elegant one with two distinct tables separated by white space and each having three columns to include the required text on a white background. 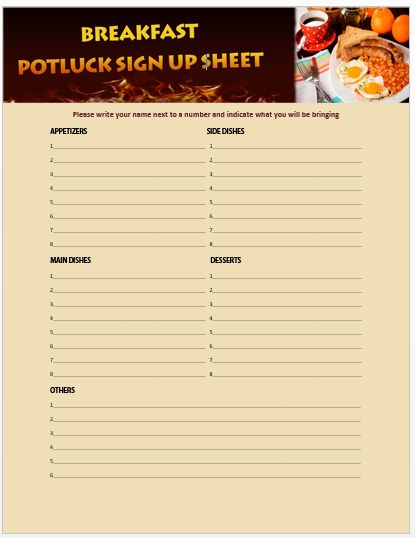 The header image also seems apt for a breakfast potluck signup sheet. The above one features a bright design layout with a color combo of red and white. Images of forks, plates, spoons and a knife to its top-right position, and an image of a piping hot drink to its top-left gives it a distinct charm. Light yellow color of the signup sheet offers a soothing backdrop on which the header in contrasting brown and the tables look quite sophisticated. With attractive images to its top-right, it seems perfect for a breakfast potluck party. The sheet has a light color scheme with baby pink on a white pristine background. The only bright part is the top-most one with a black header box having a heading in yellowish orange and an image inside a yellow semi-circle. 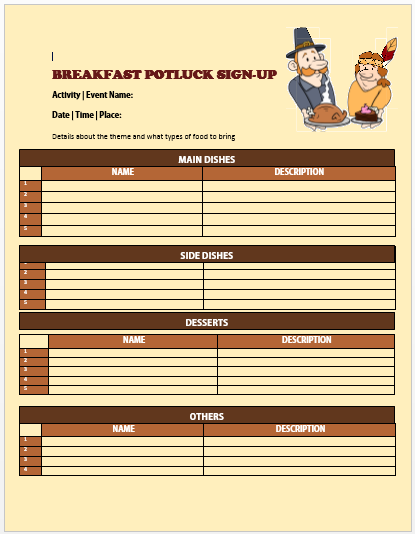 The beautiful blue border around a white text box and the multi-colored horizontal line at the top makes it look an adorable one as a breakfast potluck party signup sheet. The two header boxes in two different colors and two tables with four columns makes it look quite a professional one. 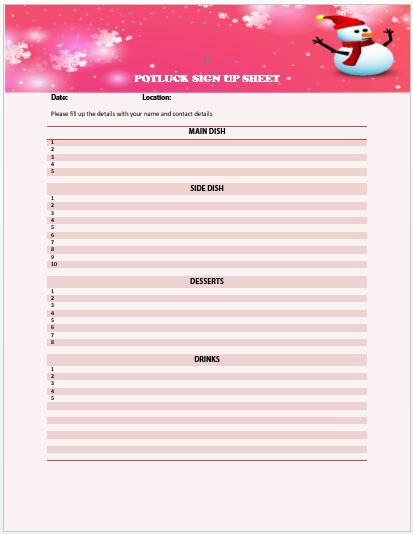 If you are looking for a simple signup sheet for your potluck party, the above one can be a perfect pick with minimal design and an amazing background featuring a starry night. There is ample space to include text in contrasting black in two columns. 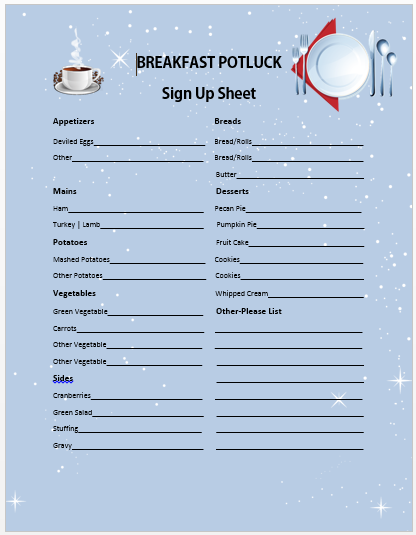 With images of multiple breakfast items to its top-right corner, the signup sheet looks every bit for a breakfast potluck party . Further, the use of contrasting colors like orange and green on a light colored background makes it all the more appealing. The black bold header at the top-left and an image of a chef holding a dish inside a yellow oval on a white background are the highlights of the above sheet. Th rest of the sheet consists of a large table with its rows in alternate white and light-red color. 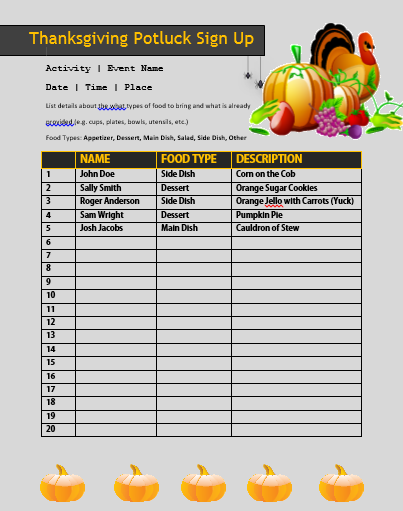 The top-most part of the design layout of the above sheet consists of an attractive graphics while the remaining half is in light yellow with categories of menu items in black. The bullet points below each of the same offers more clarity. The image to one of the corner of the sheet looks like a banner in green. The rest of the sheer features four tables with its menu item categories in orange rows and name as well as description of the same on green. The sheet oozes clarity in terms of its design layout as it is devoid of unnecessary frills and features two columns for including desired text in contrasting white on a navy blue background. However, the blue header box has a multicolored border to its top-most side and some interesting images too. The sheet has a light background and a single table with a black border and multiple rows. 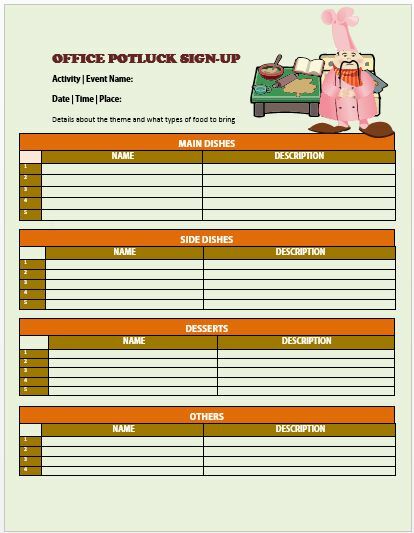 The header in contrasting black and images of a knife, fork, and a pressure cooker makes it apt as a breakfast potluck party signup sheet. The above sheet features multiple images of attractive looking dishes at one corner and a header in contrasting yellow on a black header box. The single large table with multiple rows and columns below the same gives you ample space to include your text with clarity. 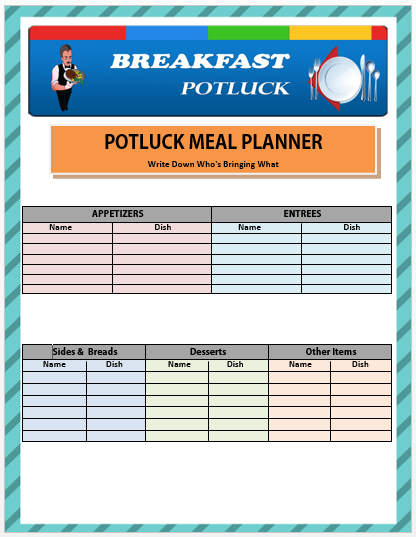 So, let us have a look at the things that you should keep in mind to host a successful breakfast potluck party. Christmas celebrations seem incomplete without throwing a party that promises great food and drinks. However, rather than cooking food for 10 or 20 people whom you like to invite at your home, hosting a Christmas potluck party can be more enjoyable. 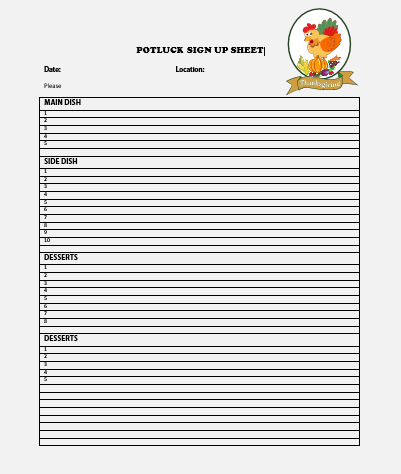 When you do invite, it is essential that you have attractive potluck sign up sheets. 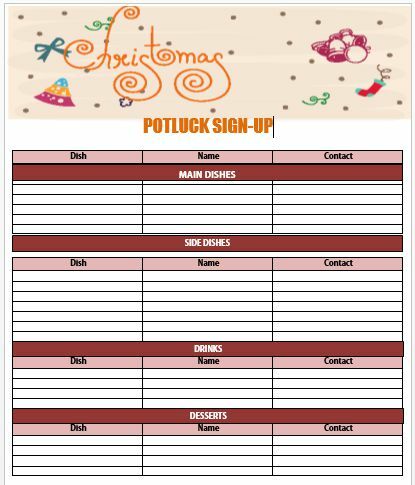 Here we present you with eye-catching Christmas Potluck Signup Sheets to impress your guests. You can easily download them and customize them based on your requirement. The sheet consists of a decent color combination of multiple colors. While the top most part of the design layout is devoted to graphics, the rest of the layout features a huge table with a black border and text in white on a contrasting background. 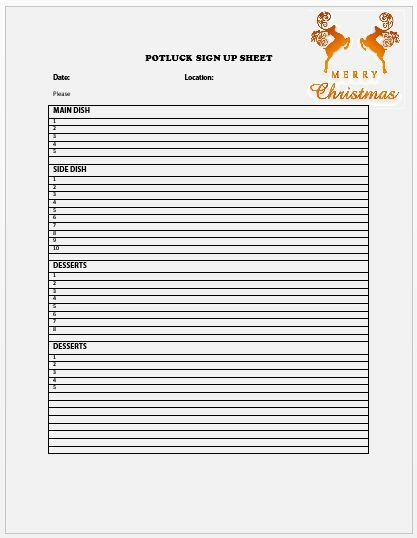 The sheet is a bright one full of Christmas festivity with a bright red header box featuring an image of a snowman and a Christmas tree on each side of the header. It also features a red horizontal line at the bottom with rest of the sheet in pristine white. Christmas seems so incomplete without hanging Christmas bells. An image of the same on a light yellow background with a header in contrasting brown justifies the same in the above sheet. It features four tables with a black border and white text below the header space. The sheet is a beautiful one depicting an image of a snowman wearing a bright red cap and a scarf on a baby pink background studded with white flowers of various sizes. Apart from date, location and some instructions, the rest of the sheet features several rows in light pink on a white background. The signup sheet has a lovely green border with slanting stripes in a bit darker shade around a white text box. While the upper half has the header box on a light background, the lower half consists of two tables with multiple light colored cells and black headings. Studded with bright sparkling stars and two Christmas trees, the light blue colored background of the sheet features a cute image of a snowman holding a pot and its text in two separate columns. 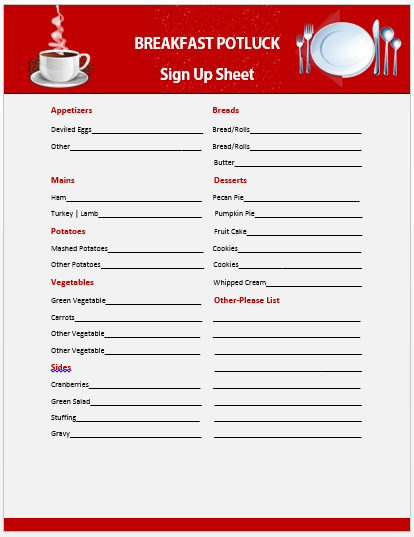 The bright signup sheet consists of four separate tables, each with two columns and identical number of rows on a light colored background. The combination of bright of bright orange, green and red makes it look just awesome. 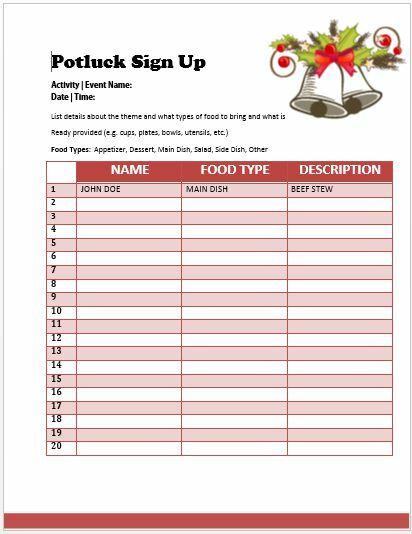 With an illustration of Christmas bells decorated nicely at one corner on a pristine white background, the Christmas potluck party signup sheet is immensely likable. The text in black and the large table below the same with four distinct columns makes it all the more eye-pleasant. The design layout is no frill one with a light background containing horizontal lines and bullet points to include the necessary text under different headings and a bright red header box with a contrasting white header. 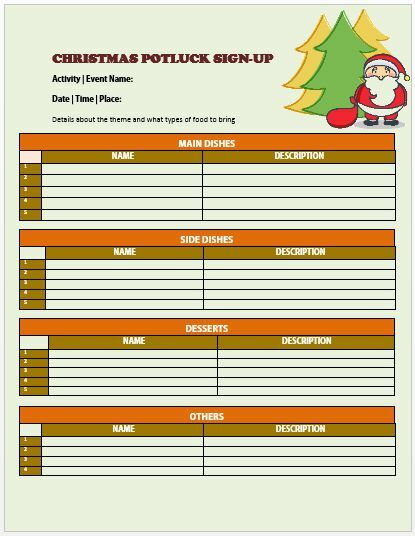 Christmas seems incomplete without Santa and the above signup sheet for a potluck party features not only a cute image of Santa, but also Christmas trees in one of its corner. The light green background, the use of bright colors in tables and the use of white contrasting font makes it perfect for the occasion. 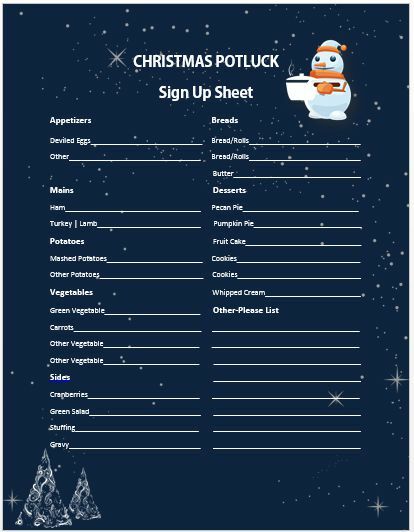 The signup sheet is apt for a Christmas potluck party since it features a snowman to its top-right corner, and even clear illustrations of two Christmas trees to its bottom-left corner on a navy blue background studded with stars. The sheet in pristine white features an image of a pair of dancing rein deer at one of its corners in golden yellow. The rest of the sheet is however, quite simple with a large table consisting of numerous rows and a total five headings. The sheet has a sophisticated look with a gray background on which there features an attractive image of a snowman at its top-right corner. 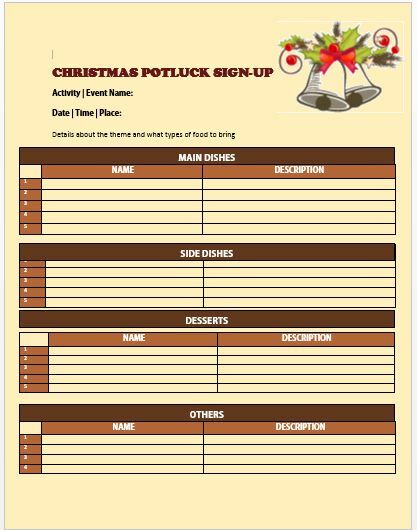 The use of yellow and black to indicate the text add more charm to the Christmas potluck sign-up sheet. It is very simple but you need to remember the things that will make it an absolute success. Having a theme party during Christmas holidays can be a matter of great fun! 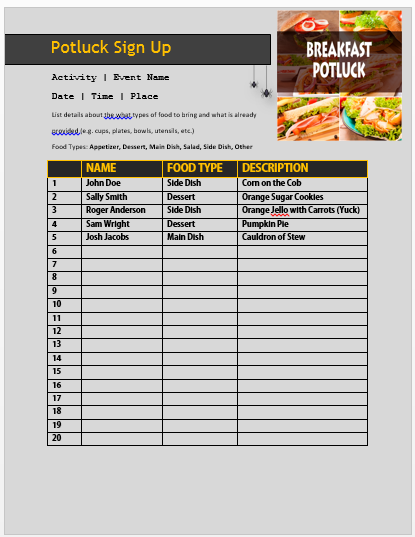 Communicate with your guests and decide on a theme for the potluck party. For example, you ask them to bring food items that start from the first alphabet of their last name or may have an ingredient that starts with a specific alphabet like ‘C’. Now, this ingredient can be coconut, cheese, carrot, chicken, etc. You can be very creative while deciding the theme. 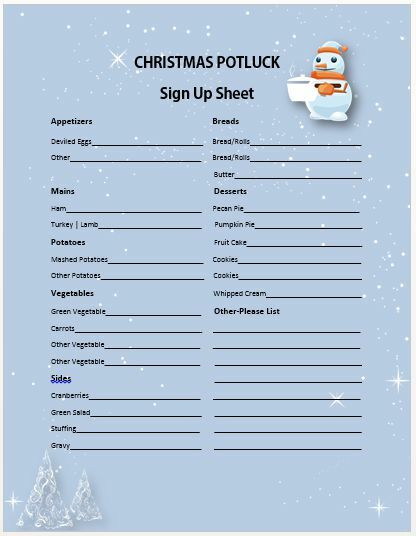 Create a signup sheet to invite your guests to the Christmas potluck party. 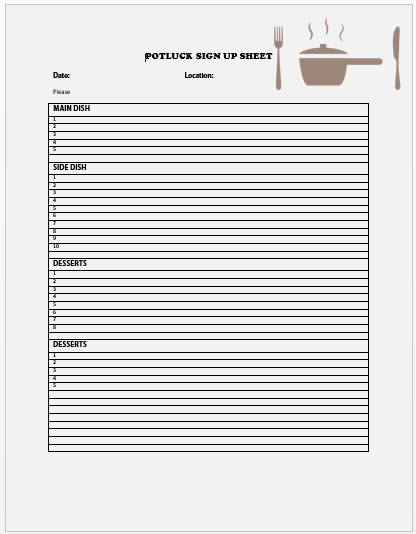 You can use free signup sheet templates available on this page for the same to have some comfort. Also, request them to contact you in case, they have any question in their minds regarding the food items or the party arrangements without any hesitation. It is vital to have a food list prepared in advance for the party as otherwise, it may happen that all are bringing appetizers or starters on the party day. The menu should be a balanced one with beverages, starters, appetizers, main course, desserts, and more. While preparing the list, communicate with your guests and inquire if any one of them is a strict vegan or has some problem with dairy products or food items rich in starch. 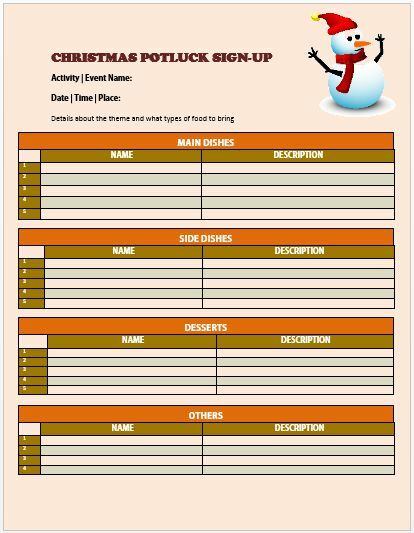 Now, assign a food item prepared in your list to each of the guests who will arrive at your home for enjoying the Christmas potluck party. If someone is really busy or can’t cook anything because of poor cooking skills, ask him or her to bring some ready-made food item like pizza, a bag of chips, cake, etc. If any of these things are not possible, request to bring some serving platters and napkins or you can even seek help in food arrangement on the table and party decorations. Decorations is a must for hosting a Christmas potluck party at your home. You can either buy expensive decorative items from the market or use creative ideas to make your home extremely inviting. Hang oversized snowflakes above the dining table, display greeting cards or you can also put a Christmas wreath on the front door! There is no dearth of creative DIY ideas for Christmas decoration that you can found easily over the web. On the part day, it is time to arrange the table with disposable cups, bowls, and plates as cleaning so many utensils on the next day can be very taxing. If possible use biodegradable tableware like sugarcane bowls, bamboo or wheat straw plates and more to go environment-friendly. Finally, have a gala time with your friends during the party, have meaningful conversations over food and have an absolute fun. 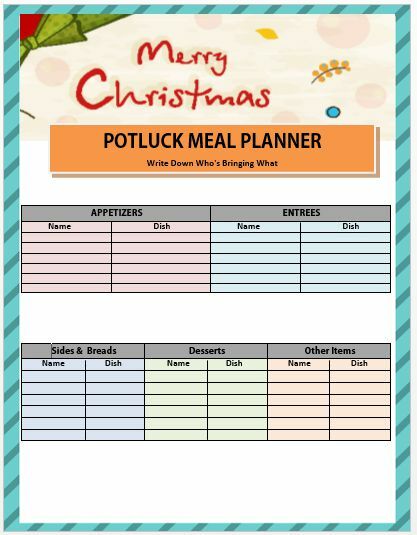 With proper planning hosting a Christmas potluck party is quite easy. Thanksgiving day is always a wonderful day, much anticipated by everyone in the United States of America, Canada, and some other countries. Preparation of traditional food items are a major part of the thanksgiving celebrations but what if you are thinking to host a thanksgiving potluck party, it can be great fun! 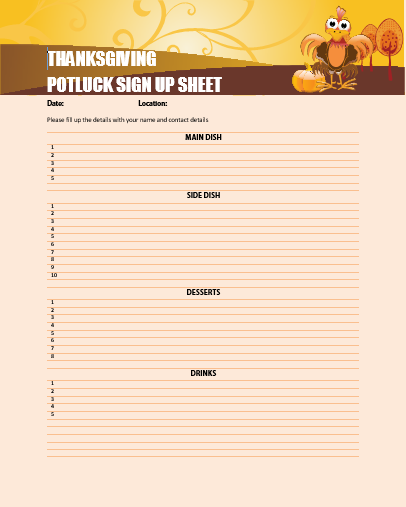 We have some wonderful signup sheets for your thanksgiving potluck party that will make it easier for you to host the same. 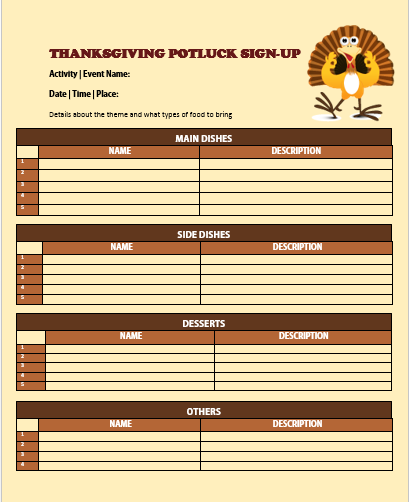 The yellow colored sign-up sheet with an image of a cute turkey to its top-right looks beautiful for a thanksgiving potluck party. Further, the color combination of different hues of brown with yellow and text in white looks awesome. The signup sheet is a vibrant one in terms of its colors with bright orange, dark green, light green, yellow, red, and more all present in the design. Maple leaves, a huge pumpkin and a hat to the top-right is quite eye-pleasant. 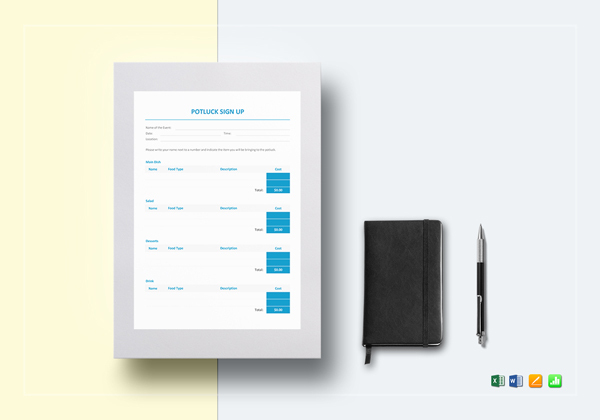 The signup sheet is a sophisticated one with beautiful images at one corner and four tables with the identical color scheme but different sub -headings in white on a light green colored background. 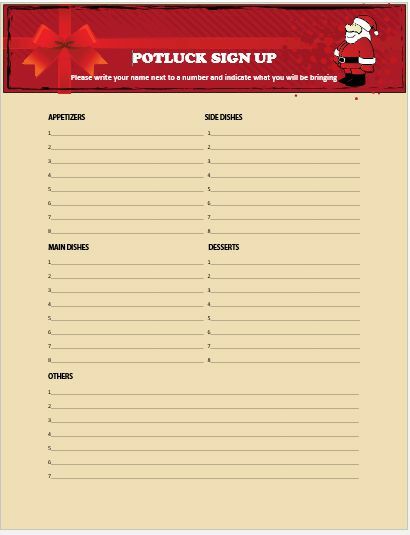 The most distinct feature of this signup sheet is the use of a box for a header, a single large table, and use of images in both top-right corner and at the bottom. 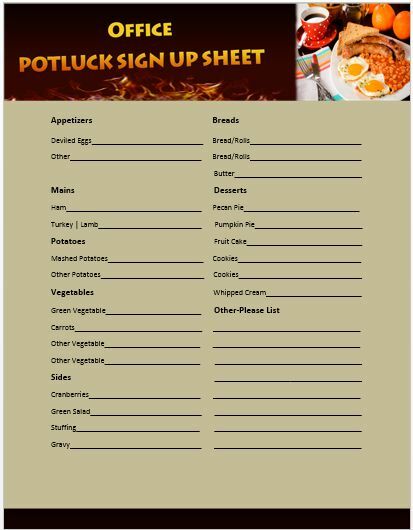 The color combination of gray and yellow is not a usual one seen in thanksgiving potluck party signup sheets. 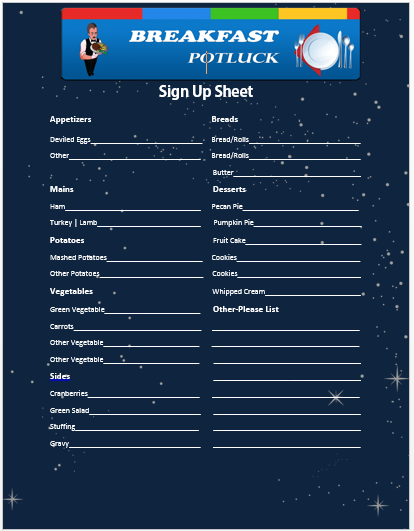 The signup sheet has a blue background with stars shining here and there on which a two column design layout looks elegant. The use of images on both sides of the black header and at the bottom makes it look quite different from others presented in our collection. 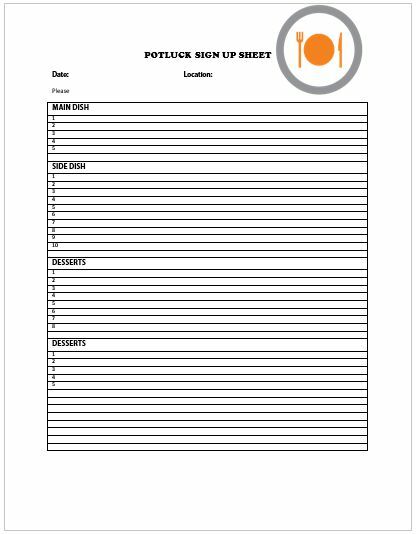 The signup sheet comes with a wide header box in hues of bright orange and yellow on a white background. The use of contrasting red to indicate headings and rest of the text in black seems to augment the beauty of this design layout. 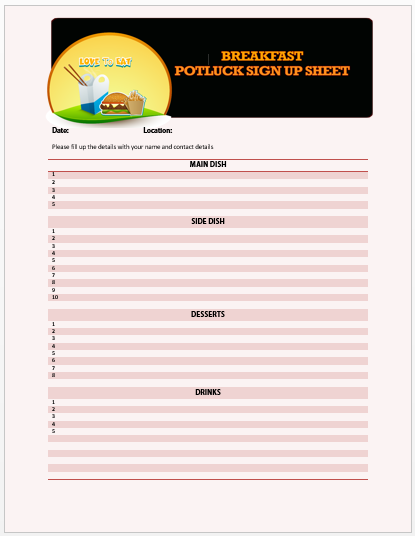 The signup sheet is a simple one with just a large table with black headings and border on a white background and a vibrant image at the top-right within a circle. 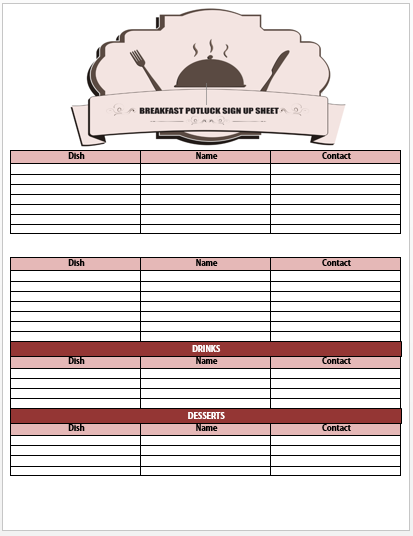 The color combination of red and pink always look great and this signup sheet is not an exception. 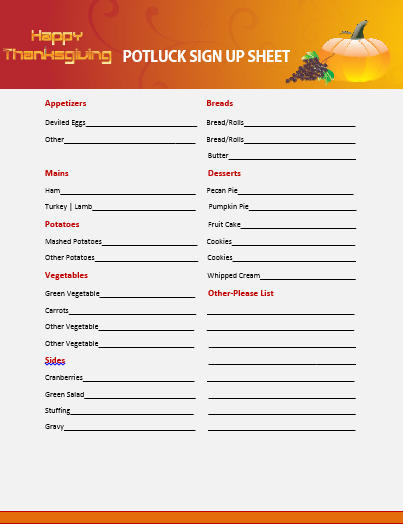 With an image of a huge yellow pumpkin and a bunch of purple grapes at the top-left on a red colored header box, the sheet is just perfect for a thanksgiving potluck party. The sheet has a sophisticated look with a great combination of bright and light colors to build contrast of the right amount. While bright yellow and brown is used at the top in a header box, the rest has a light creme background with bullet points and text in black. 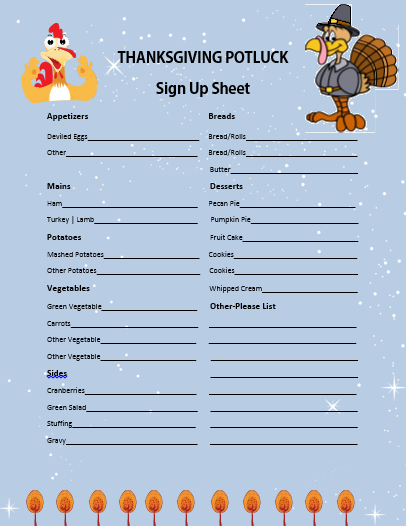 The most striking feature of the signup sheet is the images of a cute turkey and a large pumpkin at the top on a white background i.e. just beside the black header. The red and pink table furthers adds a new charm to the above sheet. 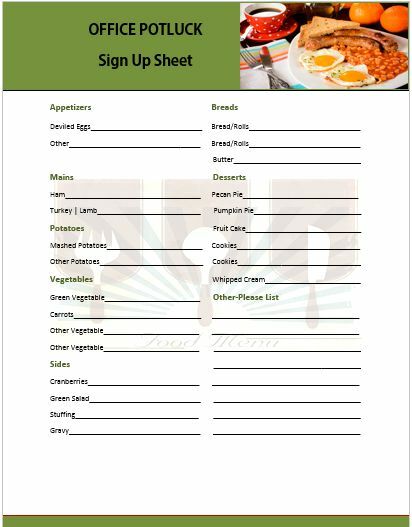 The signup sheet is a simple one with a large table with a black border and black text in two columns and several rows on a white background. If you love simplicity, this one is the best one for you. The best one is reserved for the end as this one looks really promising with a beautiful image of a turkey at the center-bottom and the use of orange, red, and yellow for the heading on a light colored background. Thanksgiving potluck party can be a good opportunity for you to learn some new recipes and taste some really awesome dishes. 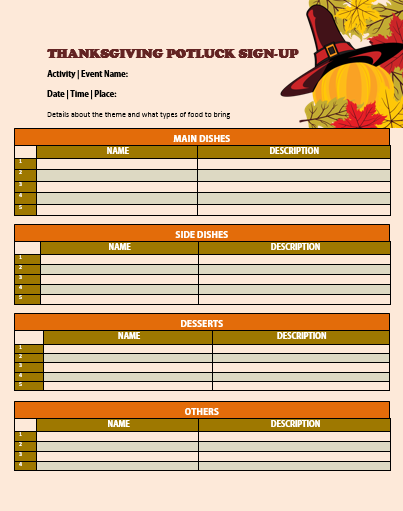 Moreover, it eliminates the need to spend long hours cleaning in the kitchen to prepare food in a large quantity for your guests, but like any other party, a thanksgiving potluck party also needs extensive planning. So, please have a look below. 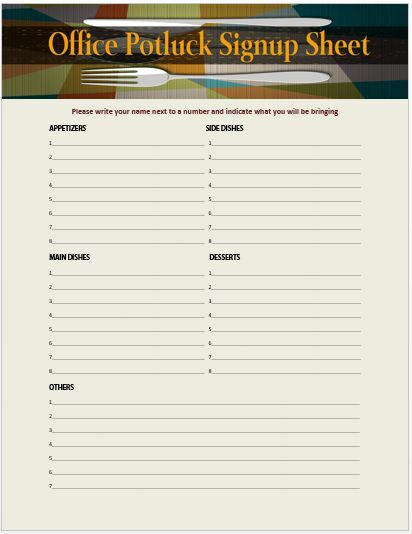 This is the first step in planning any party be it a birthday or a potluck as unless you know the number of guests you will have in your home and their names, it is not possible to coordinate with them. 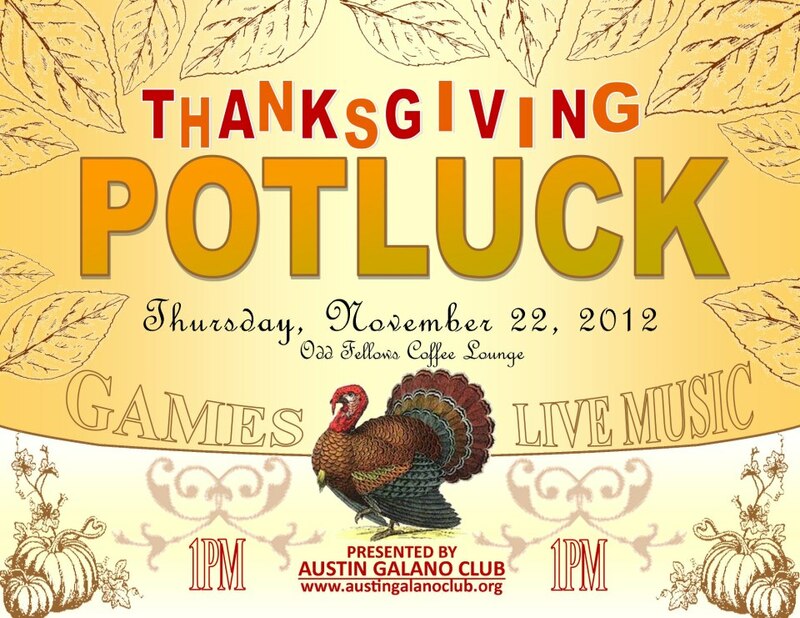 You can consider inviting your friends, colleagues or family members in the thanksgiving potluck party. 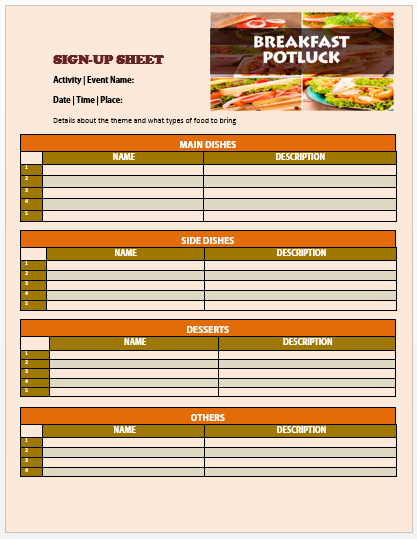 For invitations, either you can make use of free downloadable potluck invitation cards that are available on many sites over the web or you can also create DIY customized invitation cards for your guests. Do not forget to include your contact number on each of the card so for any queries regarding the party, they can get in touch with you immediately. Now, this one is a herculean task as the menu must include a great variety of lip-smacking dishes that everyone should love. Also, you need to take care of the fact that whether the majority of your guests are vegan, vegetarian or non-vegetarian. Choose some appetizers, starters, desserts, drinks, and of course, the main course for your thanksgiving potluck party menu. The best way to do the same is to consult with your guests about the menu items. This way you can never be wrong. 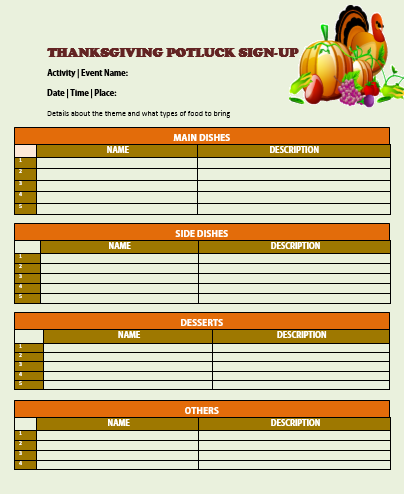 This is a crucial step in planning and there are many online tools that can help you in assigning a type of dish to each of your guests invited in the thanksgiving potluck party. You need to thoroughly communicate for the same as it may happen that some of your guests are not aware of the recipe of that particular dish or have no time to prepare the traditional dish because of work or family commitments. 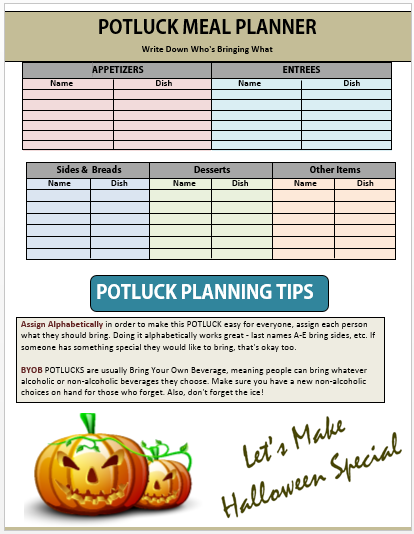 So, before assigning the dishes, it better to forward them the potluck party menu. Again, if someone does not know how to cook, substitute the assigned dish with any readymade food item like pizza, burgers, cakes or sandwiches. It is advisable that as a host you should assign the main dish to yourself so that in any case the person assigned to bring the main course could not attend the party remaining guests can have the main couse which is very important. It may happen that you don’t have so many serving platters at your home, so it is wise to request your guests to bring their service platters along with the cooked dish. If you have plenty of serving platters and bowls, it is wise to skip this step altogether as not many may seem comfortable with the idea or may get offended. Also, check whether you have some extra tongs and bowls for the occasion or not. There is nothing wrong to go green while having your own enjoyment. So, instead of opting for your regular utensils for the party, buy biodegradable or environment-friendly utensils from a nearby shop. If you are not getting the same, choose disposable cups and plates so that at least you don’t have to engage in cleaning all the dirty plates. Now that everything is done, invest some time and energy in decorating your home but while decorating do not forget to place a trash can at a strategic place to collect the dirty plates and cups. Also, place as many napkins as the number of your guests on the table cloth covering your dining table. As a host, you can also buy something from the market to award the one whose dish got the most appreciation from other guests present in the party. 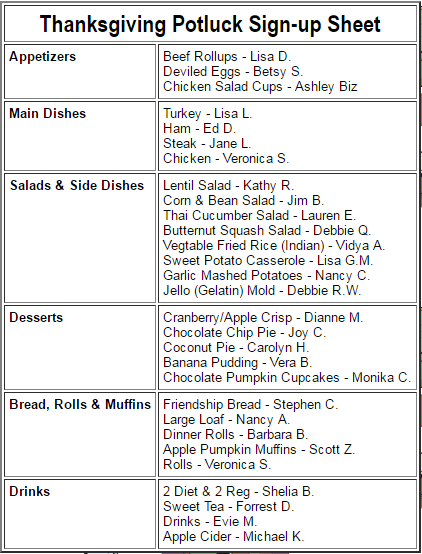 If you are not sure what food items to cook or include in your thanksgiving potluck party, please have a look. 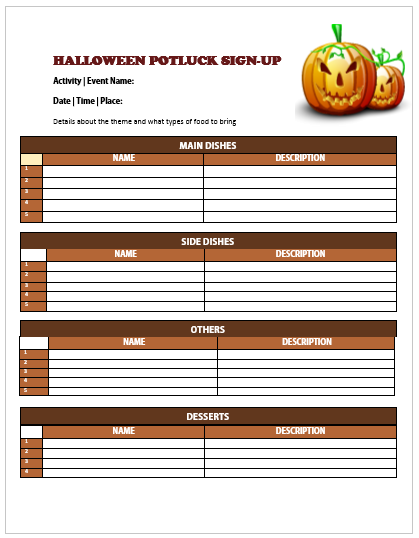 Organizing a Halloween potluck party can be a great way to relish a great variety of dishes under one roof and that too without spending much. However, it needs a little bit of planning and co-ordination among friends or guests to have a blast! First of all, ask your friends to attend the potluck party in Halloween costume. This will make the whole affair a spooktacular one! Decor your house or the party venue by using some Halloween party supplies that you can found in plenty at inexpensive rates at countless online shops. You can also do the decorations yourself at home by using your creativity and taking help of the innumerable Halloween decoration ideas over the web to have your perfect Halloween potluck party. 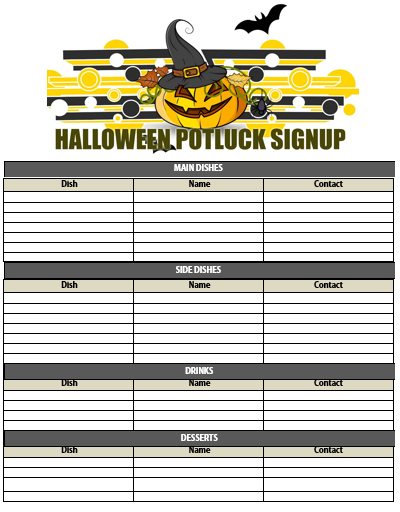 Now, that you know how to host a fabulous Halloween potluck party, let us have a look at our collection of Halloween potluck signup sheets that will be of immense use. 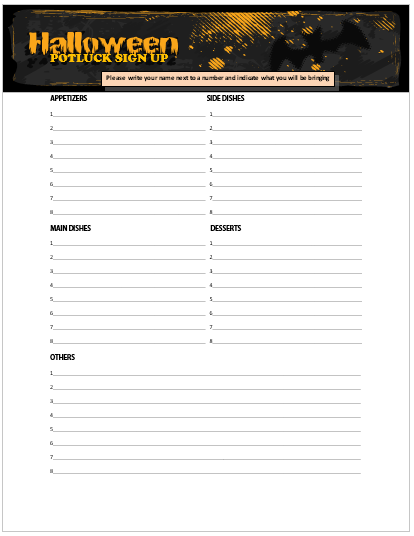 The signup sheet features a scary pumpkin face wearing a hat at the top on a bright yellow and black background.There is also a flying bat at the top-right on a white background. The rest sheet consists of three columns and several rows in a table. The wide header in a shade of brown and gray and two distinct tables with their colorful cells are the hallmarks of this sheet. 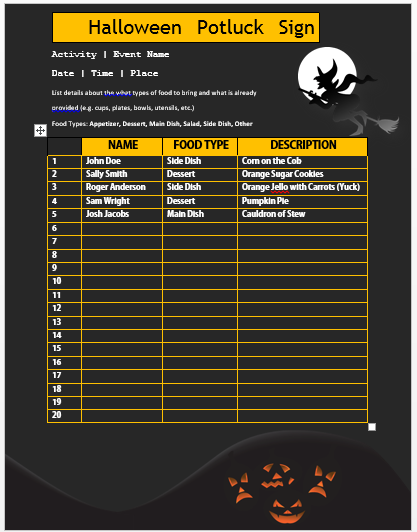 It also feature two text boxes below the tables and an image of Halloween pumpkins to its bottom-left on a white background. The sheet is a simple one with a table consisting of multiple rows under different headers on a white background. The only colorful element is the illustration to its top-right corner that features a setting sun, two huge pumpkins, and a few flying bats. The sheet is a colorful one with an orange circle with text and images of a pair of bats to its top-right. There is also a table below the same with cells in red and white. The narrow horizontal line to its bottom makes it all the more attractive. The sheet comes with a bright wide header with text in contrasting color. The rest of the sheet is in light gray with text in black and red. There is also a horizontal line at the bottom in red. The sheet is a simple one with a wide header box in black and tints of orange on which the header is in bright orange. Below the same, the presence of a pink textbox with text in black and bullet points under headings gives it a clutter-free look. The sheet features an image of two pumpkins in one of its corner near the brown header on a white background. Its highlight is however, the four tables separated from each other by a little white space. The sheet has multiple images, one at each of its corner except the top-left that has the header in a black header box on a white background. There is also a large table at the center with four columns and 21 rows. The sheet has a black background on which the graphical elements in bright yellow, orange and white are creating a perfect contrast.The large table with yellow border and the orange header box makes it quite attractive. 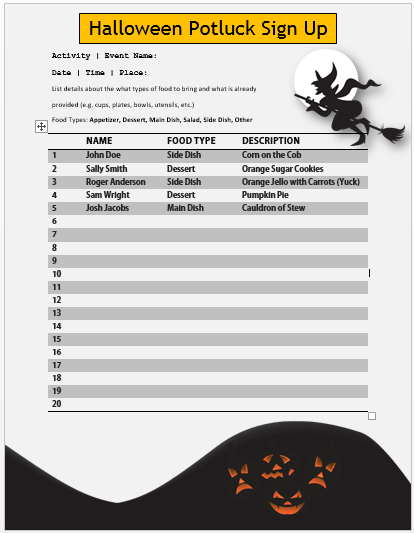 The light gray colored sheet has its header in a bright yellow text box and there is also an image of a witch flying on a broom amidst moonlight that makes it perfect for the Halloween potluck party. Planning at least two weeks before the party can do wonders. 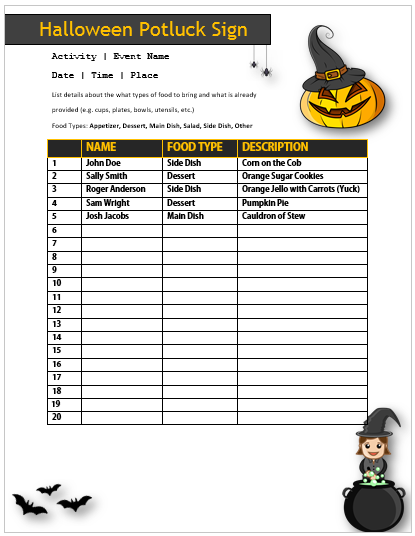 So, let us have a look at the things that you must remember while planning a successful Halloween potluck party. 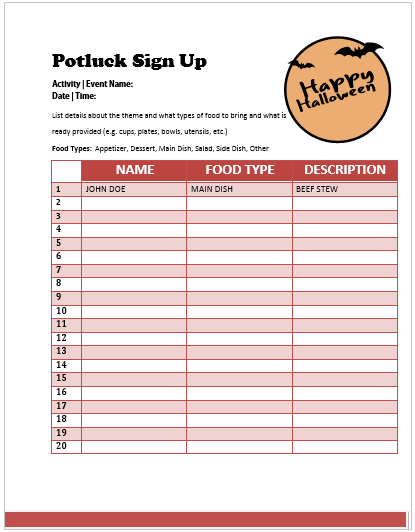 Create a Halloween potluck party signup sheet so that there remain no confusion about who is going to bring which food item. 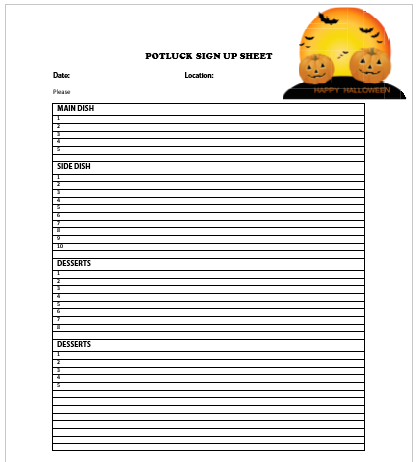 You can also take the help of our free and downloadable Halloween potluck party signup sheets to serve your purpose. Potluck party may seem a little old-fashioned for today’s generation, but it has its own charm. Especially, if you are too busy to visit your friends, organizing a potluck party at home can prove both inexpensive and entertaining. While potluck parties are very common in the US, it is quite rare in the United Kingdom where it is vert uncommon to ask your guests to bring food in a party. The term ‘potluck’ was used probably for the first time by a playwriter-Thomas Nashe in the 16th century to suggest an idea of organizing an economical casual get-together. However, organizing a potluck party involve some points to remember to avoid any unpleasant experiences. So, let us have a look. Have your extra serving platters, napkins, spoons, and plates ready before the arrival of guests. Do not forget garbage bags! 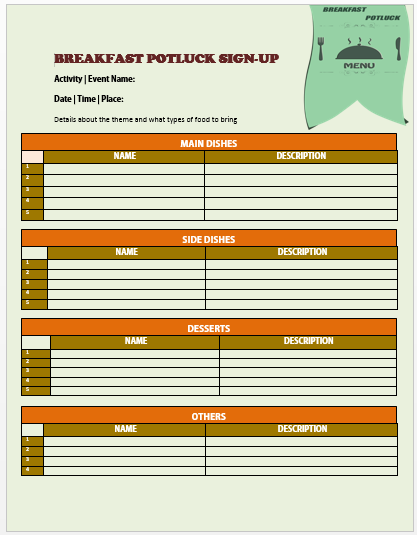 So, now that you know how to organize a successful potluck party, have a look at our potluck party invitation templates that you can download to use right away to have some comfort.